In my years of experience creating and maintaining websites for business owners, I realised many people are somewhat confused about the different costs involved in maintaining a website, and they sometimes underestimate them. So I’m dedicating this post to give you a breakdown of the various costs you need to be looking at when it comes to owning and maintaining your own website in Singapore. I hope this will be helpful especially for new business owners and entrepreneurs to have a better understanding and make smarter budgeting plans for your company website needs. Let’s dive in! Let’s start off with the domain name. This is often the first thing you need for a website. For instance, the domain name of our website is webbuddy.sg. The purpose of a domain name is to serve as your web address. So that when people type your domain into a browser, it points them to your website and people can surf your site and understand more about what you do. Assuming you have in mind a domain name for your website. How do you know if it’s still available? The quickest way is to go to Vodien Hosting, type in the domain name of your choice and the search results will immediately tell you whether it has been taken or it is available for you to purchase! There are various domain extensions that you can choose from: If the main target market of your business is Singapore, you can consider going for domain extensions like .sg or .com.sg. If you are targeting the global market, I would suggest going for .com or .net. You may have noticed that it is more expensive to own a .com.sg or .sg domain name. Yes, you are right but there’s good news. If you are a new business owner, you may be eligible to get your first year domain name for free (only for .com.sg and .sg) under the Singapore Infocomm @ SME Programme! Click here to check your eligibility. Once you have decided on a domain name that serves as your web address, what else do you need? The next thing you’ll need to consider is web hosting. In order for your website to be visible to people on the web, your website must be stored on a server. That’s where web hosting services come in. They give you access to store all your website files and content on their server so that people from any part of the world can view your website as long as they have an internet connection. There are different types of hosting available and they can be broadly categorized into shared hosting and dedicated hosting. Shared hosting basically means that you are sharing a server with many other websites. The advantage of this is that it dramatically reduces the monthly fees that you pay to use their servers, ranging from S$10 to S$50 a month. The trade-off is that your website may load a little slower at times when the server is experiencing heavy load or traffic. Dedicated hosting on the other hand is much more costly, starting from S$280 to S$2000+ a month. But chances are you wouldn’t need a dedicated hosting unless you use a lot of server resources (which your developer or hosting company will alert you if such things happen). In the beginning, a shared hosting package should be good enough to start with and I suggest that you find a hosting company that is based in the same country as your main target market. If you’re looking for a reliable hosting company in Singapore, Vodien Hosting is my recommended choice because I have been using their services for the past few years and I find their server fast and they offer good and reliable support. If you’re going with Vodien, their basic hosting package starts from S$10 per month. Now that we have the hardware taken care of, let’s move on to the software! Now honestly this is a huge topic in itself but I will do my best to simplify things and help you to take away the most important concept – here we go! Then came along the second generation of website editors like Dreamweaver and Microsoft FrontPage that allowed people to create websites without having to rely heavily on programming but there were still many limitations as it wasn’t possible to add a forum to a website easily using these editors. In more recent years, technological advancements have seen Content Management Systems (CMS) like WordPress, Weebly and Wix gaining wide popularity. With CMS platforms, you can now create a professional website without having to learn any coding! WordPress is the most popular CMS in the marketplace and one of the main advantages is that it is free to use; there are no recurring fees to pay month after month. Most hosting providers also support WordPress, which means you can easily install WordPress on your hosting in a few clicks, free of charge, once you sign up for your web hosting package. What I like most about WordPress is its extensibility. Today you can be having a basic informational WordPress website. But you can choose to build in advanced functionalities like shopping carts, business directories, appointment booking systems or social media platforms onto your existing website anytime by installing what we call plugins. There is no need to tear down what you have created earlier and rebuild from scratch. WordPress plugins offer you the convenience and flexibility to adapt to your evolving needs as your business grows over time. There are many plugins out there that you can choose from and you will be able to find some great ones that are even free to use! The downside of WordPress is that due to its popularity, it is very vulnerable to hacking. So it is extremely important that you keep your WordPress website updated whenever there is a new patch released by WordPress so as to minimise security vulnerabilities. While WordPress itself is free to use, you just have to be mindful of some costs that may be incurred depending on specific plugins and themes (which are design templates that control how your website looks) that you choose to use. Some of them are free, but some require you to pay an annual license fee in order to use them. It all depends on your preferences. If you do choose to use paid themes or plugins, then just remember to allocate additional budget for it. Always check with your web designer if he/she is using any themes or plugins that require you to pay any annual fees. This is important so that you are aware of the costs before you give the green light for them to use it for your website. Now that you have a basic understanding of how WordPress works, let’s take a look at Weebly and Wix. Unlike WordPress, you don’t ‘install’ Weebly and Wix on your own web hosting because they run on their own dedicated servers. Which means if you use Weebly or Wix to create your website, there is no need for you to purchase a separate web hosting package. It already comes with your Weebly or Wix website. By default, Weebly or Wix will give you a domain name (or rather, subdomain) when you sign up for a free account with them, which looks something like this: https://yourusername.weebly.com. I don’t encourage you to use this for business because clearly, it doesn’t look professional and it weakens the brand identity of your business. I would still recommend you to get your own custom domain name and park it with Weebly or Wix (in which case Weebly/Wix will require you to upgrade to a paid plan to do that). Though Weebly and Wix allow you to create a website for free, there are a few other tricky limitations you need to be aware of. First, advertisements will show up on your Weebly/Wix website if you are on their free plan. If you ask me, that is not ideal for business for simple reasons. The Weebly/Wix advertisements are not relevant to your business. They are distracting, and it doesn’t give customers a fantastic impression of your business. You can disable these advertisements if you upgrade to a paid plan, which means that it is no longer free and you will need to incur monthly fees to use their services. Second, Weebly and Wix imposes strict limitations on the specific features that you get to enjoy at different pricing tiers. In short, the more features you need to use down the road (such as additional storage space or eCommerce capabilities), the higher a price you need to pay every single month. For example, Weebly charges US$25/month to allow you to sell unlimited items on your website together with features such as shopping coupons. 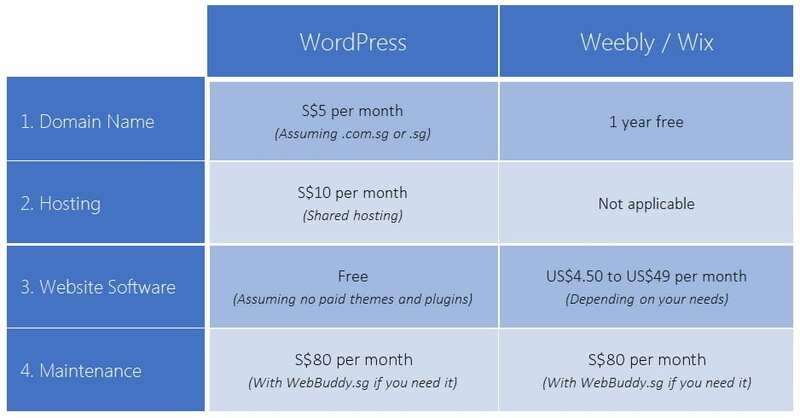 However, if you are using WordPress, you do not need to pay all these additional fees (except for your S$10 monthly hosting fees) because you can simply install plugins like WooCommerce to achieve the same results! In conclusion, if you are looking to start something quick and do not mind a basic website with advertisements, then you can try the free plans with Weebly and Wix. But if you want to have a professional website for your business that you can scale easily in future without having to pay more month after month for additional features, it is a good idea to consider WordPress. Just as a car needs regular servicing and maintenance to keep it running smoothly every day, your website needs routine care to make sure it is kept safe and healthy too! Imagine what it’s like to have your car break down on you one day. The same goes for your website. There needs to be regular, proactive intervention in order to prevent website downtime problems that cause damages and losses to your business. To give you a rough idea, website maintenance work includes updating your website content (so that it stays relevant to your business) and making sure your website software is kept up to date periodically (especially for WordPress), which could potentially cause your website to crash if it is overlooked. It is also crucial to make sure your website assets are backed up properly so you won’t have to worry about losing important data, as well as looking into other critical security aspects such as regular scanning for malware and safeguarding your website from hackers. If you are technology savvy and are capable of managing the website maintenance work on your own, that’s great! But for many business owners, time can be a huge challenge. Or you may prefer to spend your time on other priorities of your business rather than on patching or updating your website. In that case, you will need to consider ongoing website maintenance services. And basically help you with any website issues that you might have! Web maintenance packages in Singapore typically starts from S$100 to S$1000+ a month depending on the number of man hours you require. Here at WebBuddy.sg, we make our website care packages affordable for small businesses and entrepreneurs. You can enjoy 2 monthly updates as well as other value services for just S$80 per month. I hope this post has been useful and if you have any questions, feel free to post them below and I’ll be glad to answer them! Take a look at our affordable maintenance packages or contact us if you need our assistance for your website maintenance. If operating website and make earning, do we need to submit income tax for government in Singapore? Need to register a company name for this ? You will need to report the income in Singapore. It is better to register a company name for your business online too but not compulsory. Hope this helps. If open a affiliate website, do we need to declare affiliate link in our blog post? Yes, you would need to declare that is your affiliate link. Hope this clarifies.